The Hope Camp trail is located in the Rincon Mountain District of the Saguaro National Park in Tucson, Arizona. The trail begins at the end of the Camino Loma Alta Road. From there it travels eastward along an old jeep trail where it is secluded behind the foothills that parallel the much higher Tanque Verde Ridge. The trail comes to an end at the park boundary about 3.6 miles away. Enroute it is connected to by the Ridge View, North Coyote Wash, Ruiz and Quilter trails. This post follows the Hope Camp trail to its junction with the Quilter trail. To get to the trailhead follow the Old Spanish Trail Road, from its junction with Cactus Forest Drive, south for about 7 miles from the main entrance of Saguaro National Park. Turn north onto Camino Loma Alta and follow it for about 2 miles to the trailhead. The last half mile is along a graveled road. From the parking area the trail goes a couple hundred feet before passing through a gate and coming to the Loma Alta trailhead. There are several kiosks at this point as well as a small sign that indicates this is a fee area although there isn't any way to actually pay a fee unless they are expecting visitors to stop at the main entrance first. Those that have an annual or lifetime pass can hang it from their rearview mirror and not worry about it. The trail follows an old jeep trail as it heads east from the trailhead. After a tenth of a mile it comes to the point where the Ridge View trail branches off on the left. All of the intersections are well marked with trail signs that include distances to the next point. The trail signs coupled with a map make it very easy to keep track of your whereabouts. Continuing along the way the trail routes itself past numerous large saguaro and other desert flora. Just past the 3/4 mile point the Coyote Wash trail branches off on the right and a short distance later the trail passes by a windmill with several water tanks that mark the location of Dear Camp. The windmill looks like it has seen better days and is no longer bringing water up from below. Be sure to bring plenty of your own. At the 1.3 mile point from the Loma Alta trailhead the trail passes the spot where the Ruiz trail branches off on the right. 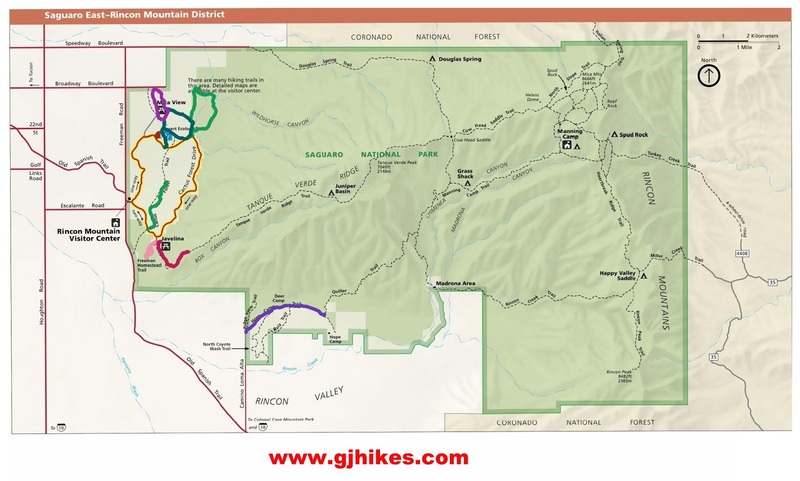 The Ruiz and Coyote Wash trails can be combined to create a loop hike. Note that mountain bikes are allowed only on the Hope Camp trail and not on any of the rest. After passing the junction with the Ruiz trail the Hope Camp trail begins a gentle climb that takes it over a small ridge. From the elevated position on the ridge it is easier to scope out the remainder of the trail and get a good look at Rincon Peak (8,482 ft.) off in the distance. After descending the small ridge the trail reaches a grassy area where the mesquite and other plants are thriving quite well. At the 2.3 mile point from the Loma Alta trailhead, or the 2.5 mile point from the parking area, the Hope Camp trail reaches the spot where the Quilter trail branches off on the left. From here it is another half mile to Hope Camp and another 1.3 miles to the Park Boundary. For this post it was the turnaround point. Hope Camp and its neighboring trails get quite a bit of use during the cooler months from hikers, trail runners, mountain bikers and horseback riders. The parking area can fill up at times leaving some visitors to park further away along the road. Horse trailers have to stop a quarter mile or so away at the last turnaround spot along the road. This hike was done the day after Christmas. The temperature started out in the upper 60's and reached the lower 70's by the time it was over. The area that the Hope Camp trail travels through is very scenic and makes for a pleasant outing. If you would like to see it for yourself then all you have to do is 'Take a hike'.